The TwinTorq motor integrates electric and hydraulic technologies in a single compact housing to reduce component count, cost, weight and size. The US Patent was allowed in December 2018, with patents pending in Europe and Asia. TwinTorq is, in effect, an electric motor wrapped around an hydraulic motor. The combined motor is then inserted into the vehicle driveline via our patented 90° gearbox design. The TwinTorq motor is based on established, proven components and requires no exotic technologies or materials. What: The core technology is a high efficiency motor for EVs that combines hydraulic and electric torque-producing elements in a single compact unit. Simulations show 25% to 45% improved efficiency over conventional electric motors of comparable power in lower speed, frequent start/stop drive cycles, to provide greater driving time between recharges. The increased efficiency permits optimized battery design to reduce cost and extend battery life. Why: Hydraulic motors are 3X more energy efficient than electric motors for launch acceleration and brake energy regeneration at lower vehicle speeds. Electric motors, conversely, are most efficient at higher speeds but utilize energy inefficiently for torque production and energy recovery at low motor speeds due to heat losses generated in the windings. 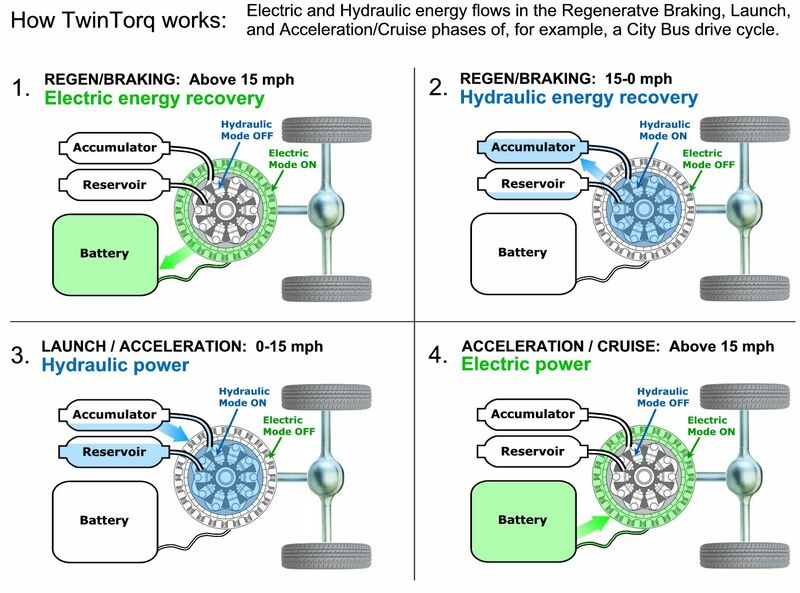 How: The TwinTorq motor substitutes low-efficiency electric torque with high-efficiency hydraulic torque during launch acceleration as well as brake energy regeneration phases of vehicle use, allowing electric efficiency to be optimized predominantly for driving/cruise speeds, and battery energy to be preserved for range (see “How TwinTorq works” diagram below). Blending electric and hydraulic technologies allows each to be optimized for its respective speed and torque demands. Control software manages torque share between both systems to maximize efficiency and reduce energy demand on the battery. 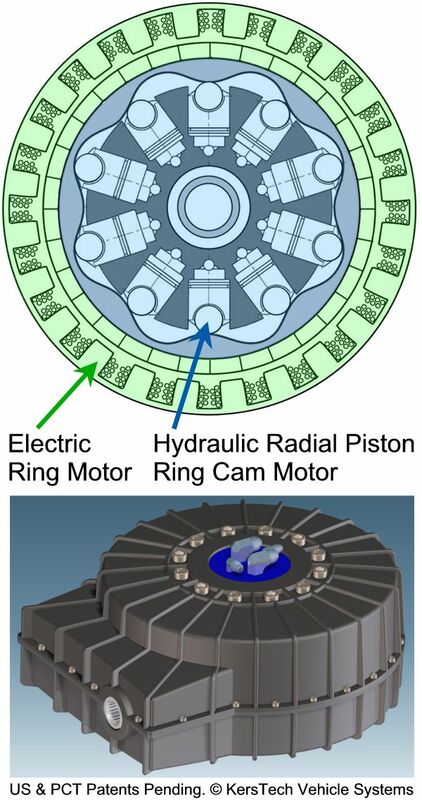 The motor’s unique electric and hydraulic design shares common rotor and stator components, minimizing physical volume and cost, while the patent pending coplanar architecture enables axial compactness or “flatness”. This allows the motor to be mounted low-in-the-chassis for improved space utilization and low center of gravity. 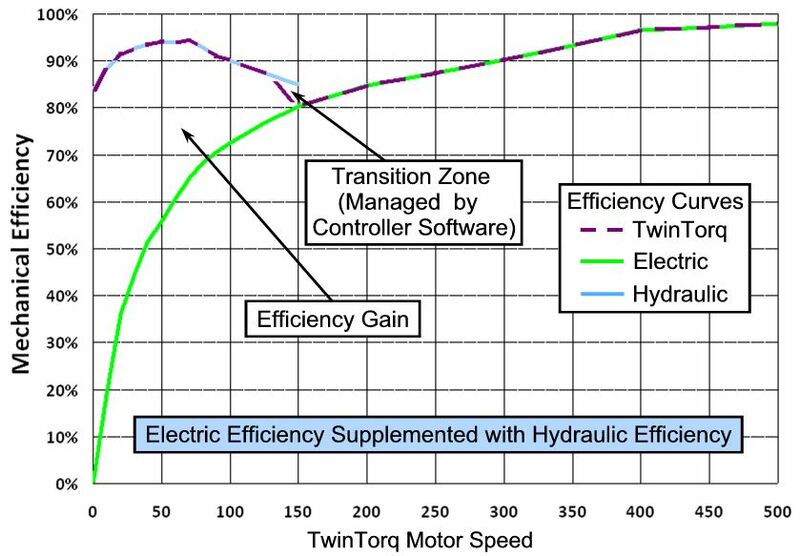 The chart below represents efficiency curves of typical electric and hydraulic motors, showing the efficiency gained by combining an hydraulic motor with an electric motor. The transition zone from one mode to the other, where hydraulic energy is phased out while electric energy is phased in, is smoothed and managed by proprietary controller software.